It's all very early, of course, but the switch to graphical tiles already reveals multiple problems with the village level generator, that ASCII art was concealing. And it's beginning to dawn on me that I won't be able to sell this new version either, despite the fact that it will take a lot more work than expected. Not with all the free games out there looking much better. But hey, I'm learning things, and if it appeals to people other than UNIX beards for a change, it's already a win. Speaking of which. I'm using a Creative Commons tileset by David Gervais (via the downloads on Open Game Art). 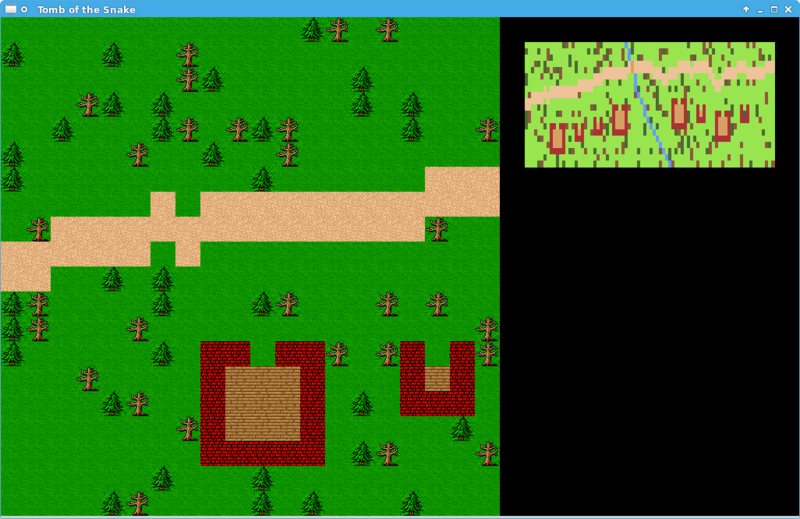 If it looks unimpressive, well, blame my relatively primitive level generation; those tiles are capable of much more. And while they look individually tiny, collectively they allow for a fairly generous game window -- one that still fits on cheap laptop screens. But boy, was it tricky to think of a good window size and layout! What is it with pixel art being largely stuck in the NES era? The Super Nintendo already used tiles of 64x64 pixels a quarter of a century ago -- not that tiles have to be square. But more about that in an upcoming article, if I manage to order my thoughts about it. Until then, don't dismiss retro graphics.